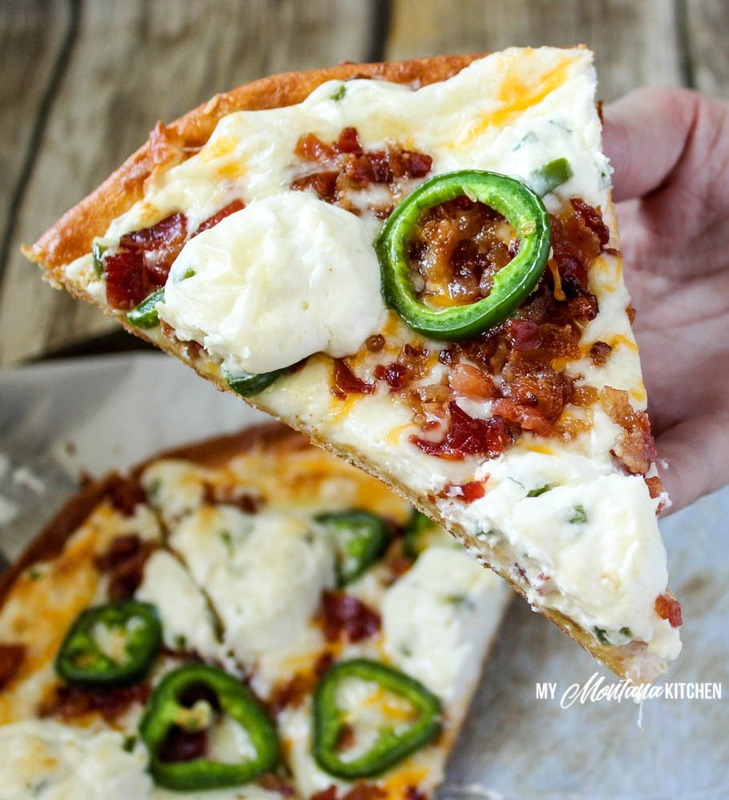 A perfectly crispy low-carb crust with jalapeno infused cream cheese, smoky bacon, mozzarella and cheddar cheeses, and fresh jalapeno slices. This recipe is low carb, gluten free, and a Trim Healthy Mama S Fuel. Yesterday, my family and I visited Glacier National Park with some of our family. On the way home we stopped at a MacKenzie River Pizza Company, a local Montana pizza company. One of the pizzas we ordered was the Jalapeños Popper Pizza. I knew as soon as I tasted it I knew that I wanted to make a Trim Healthy Mama, low carb version! I didn’t wait around – this morning I was in my kitchen! This pizza tastes just as good as the one at the restaurant! My husband whole-heartedly approved this recipe. He went so far as to say he would not miss “regular” pizza when he was eating this one! Score! It is always a happy thing when the husband and children like healthy recipes! I know people will ask “how hot is this?” I don’t have a complete answer for that. A lot of it will depend on how hot your individual Jalapeños are. You can also try to remove all the seeds to cut down on the heat. I did not think it was very spicy, but I removed most of the seeds. The flavors are delightful! And check out the crust on this pizza! It is very sturdy, almost crispy (which I like). You can definitely pick it up with your hands and hold it like “regular” pizza. The “sauce” is a Jalapeño infused cream cheese mixture. Then there are delightful little dollops of the cream cheese on top of the pizza as well. That really takes it over the top in my opinion. I’m in love with this pizza!! Is your mouth watering yet? 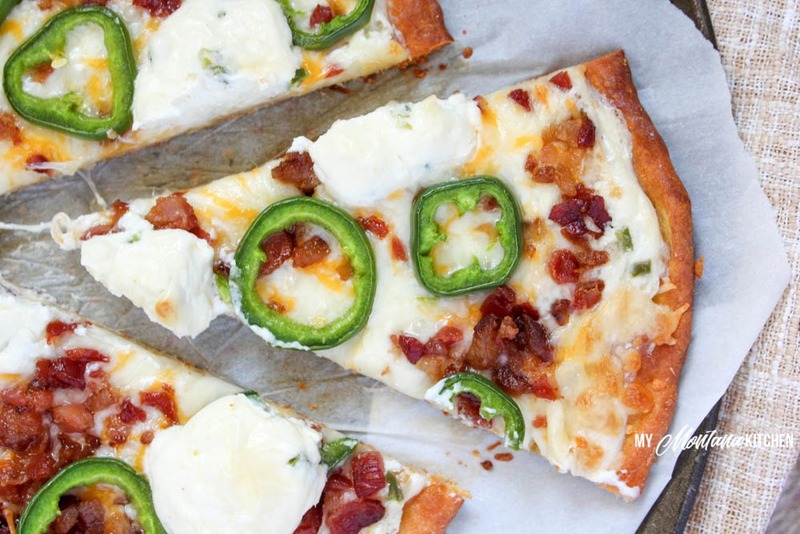 You need to go and make this pizza! This will be a recipe that sons and husbands will love! So, what do you need for this recipe? If you enjoy jalapeños, be sure to check out my Bacon Wrapped Buffalo Jalapeño Poppers! Prepare Low Carb Stromboli dough. Between parchment paper, roll dough into a large circle. Mix softened cream cheese with 2 Tablespoons diced/minced jalapeños, onion powder and garlic powder. 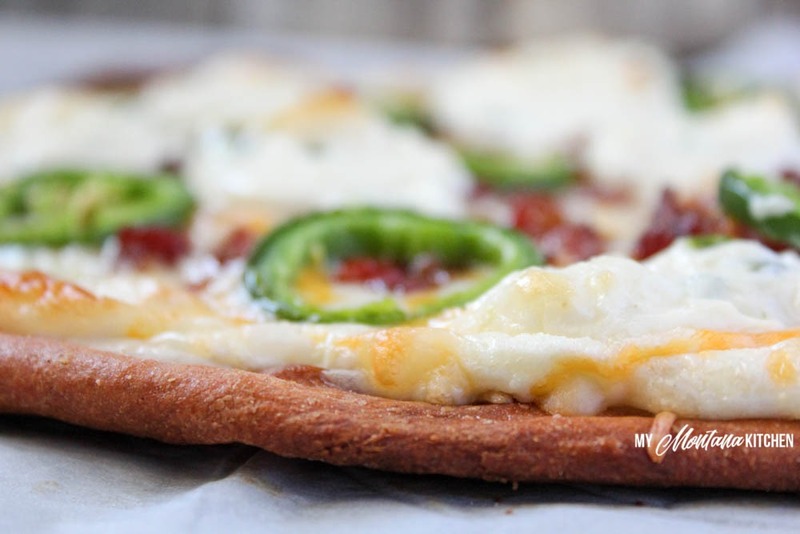 Spread 2/3 of cream cheese mixture onto baked pizza crust. Top with mozzarella and cheddar cheese, bacon, and sliced jalapeños. Drop small mounds of remaining cream cheese mixture on top of pizza. Bake for 14 minutes, or until cheese is bubbly and beginning to turn golden. For your safety, please wear gloves when cutting the jalapeños. Oh wow! This pizza is making my mouth water. I need a bite of that! Wow! That is some mighty impressive crust. . .especially considering it is low carb. I have yet to experience a low carb crust that is that sturdy. Love the toppings on this beauty too. 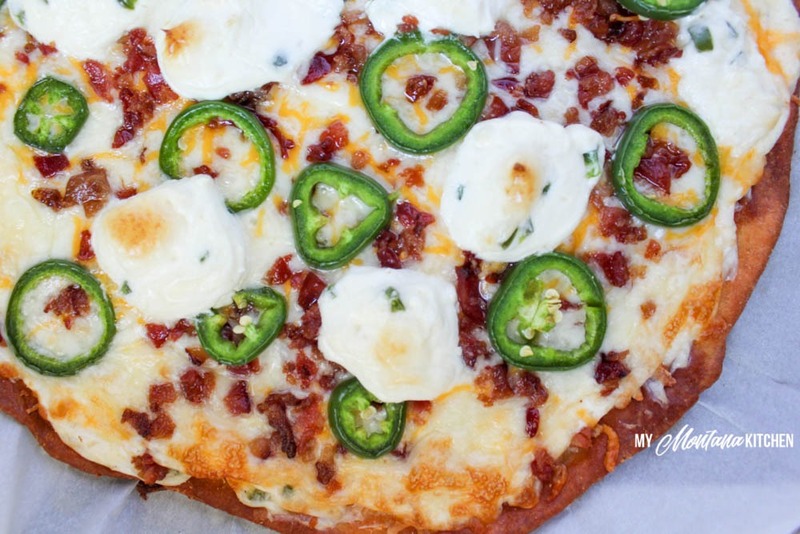 Such a fun idea to take a popular appetizer and place it on a pizza.